Stefan, Elena, Damon and Bonnie season 6. . HD Wallpaper and background images in the The Vampire Diaries club tagged: photo the vampire diaries season 6 stefan salvatore elena gilbert damon bonnie bennet paul wesley nina dobrev ian somerhalder kat graham. 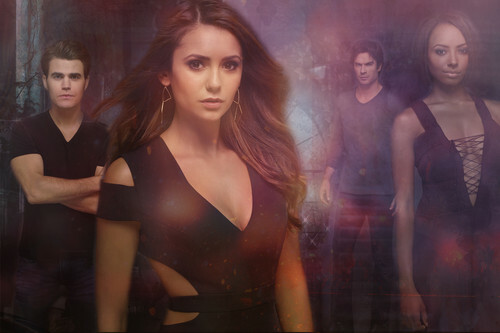 This The Vampire Diaries fan art contains bustier and بسٹیر. There might also be توجہ, اپیل, hotness آپ, جوش, swimsuit کا, swimwear کے, غسل سوٹ, سوئمنگ کاسٹیوم, غسل کاسٹیوم, سومساٹ, swimwear, کاسٹیوم غسل, تےندوا, unitard, جسم سوٹ, کیٹ سوٹ, لیوترد, یوناترد, and بلی سوٹ.